There’s a sequence in Wolfenstein II: The New Colossus in which player character BJ Blazkowicz is tasked with carrying a portable nuclear bomb through Roswell, New Mexico in 1961. The entire beginning of the level is combatless and nearly devoid of mechanical interaction—BJ can’t break his cover as a fireman. You are locked into walking and listening to the crowds celebrating “Victory Day,” the day the Nazis completed their formal takeover of the United States. It’s a strange walkabout, with traditional early-’60s Americana imagery infused with Nazi symbolism. It’s also strange because it’s not terribly different from the real world. In most depictions of midcentury Americana, just as in Nazi Roswell, the marginalized are invisible. The faces seen are white and smiling. 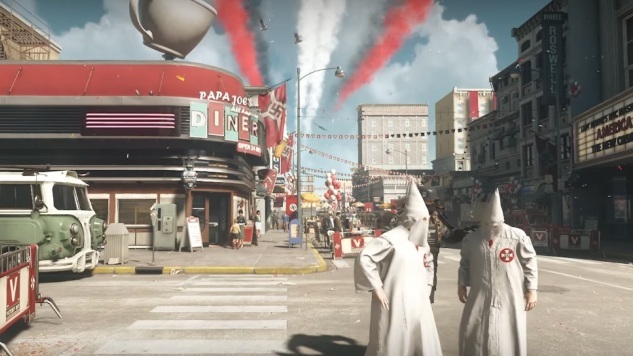 It evokes the same feeling as Bioshock: Infinite’s sterilized Columbia, but without the specifically American oppression. Roswell emphasizes something that Wolfenstein does exceedingly well: it reminds the player that the world we “could have had” under Nazi rule was not that different than the one that misty-eyed nostalgia displayed to Americans for decades. Outside of a coffee shop, a woman gushes excitedly to her aunt about her upcoming wedding. Her aunt has just put up a crop of “hardworking slaves” for auction, and wants the new fiancé to tell her father, back on the family farm. Overhead, warplanes blaze a colorful trail of red and white—no blue here. Roswell is depicted as an “almost-America,” but where it succeeds is in how it so clearly is America. In our world (the one where the Nazis lost) 1961 was the year of the publication of Hitler’s posthumous second book, simply titled Zweites Buch or “Second Book.” Written in 1928, it elaborated on the Nazi ruler’s praise for American foreign policy, specifically that of the immigration quotas of the early 1920s. Among other things, it was American legal policy around race and ethnicity that led to the Nazi system of oppression. The genocidal actions of the Nazi regime echoed, incidentally or purposefully, American extermination campaigns of Native populations. What we see in Roswell is an imagined exaggeration of Nazi rule, but also one that is deeply rooted in “American values”: immigration quotas designed to keep non-White populations as minorities, complete erasure of Native histories, and a thriving African slave trade were all present before WWII. Even in the lead-up to the war, Americans overwhelmingly opposed taking in refugees from Europe. Anti-Semitism was alive and well in America in the 1960s, regardless of specific Nazi presence. The evils of the Nazis were unique in their time and deserve to be recognized as a series of specific and despicable actions and ideologies. But they weren’t unheard of. Roswell in The New Colossus gives us a glimpse into a hypothetically different main street American town; what’s scary about it is how familiar it is.